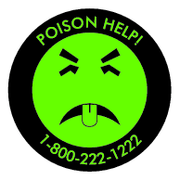 Last week, while volunteering at my daughter’s classroom Halloween party, I flinched a little as I saw one of the other parents dutifully strolling around dispensing the requisite waterless, chem-filled hand sanitizers. Aside from my skepticism that anti-bacterial soaps will actually do much to kill a virus, I also suspected the ingredients in the sanitizer weren’t much better than the germs they were designed to kill. So when the teacher instructed two of my daughter’s peers that they were supposed to wash their hands with soap and warm water instead (apparently per parental instruction), I quickly chimed in that I wanted Eliana to do the same. Still, I couldn’t help but wonder what other chemicals were being sprayed around the room when the cleaning staff arrived. This year, as Swine Flu Mania consumes teachers, kids, and parents around the globe, cleaning products are enjoying unprecedented popularity. This makes EWG’s latest safety report, targeting industrial cleaners most commonly found in school, miraculously well-timed. The results, as you probably guessed, aren’t uplifting. 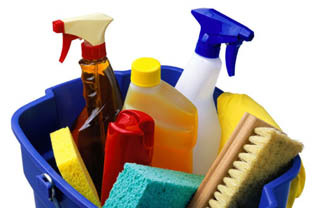 Most of you probably exert a fair bit of effort making sure your cleaning closet is stocked with the safest products on the market; frustrating, then, to learn that the bulk of your child’s day is spent surrounded by the very chemicals you are diligently trying to avoid. Testing 20 common cleaners used in classrooms and school bathrooms, the EWG found hundreds of air contaminants, most of which were not listed on the ingredients labels. Comet Disinfecting Powder Cleaner alone contains 147 Air Contaminants, of which 6 are actually listed on the label, and 7 are known carcinogens. Thankfully, the EWG does not simply hand out this unsettling information and then walk away. They offer a guide to help you talk to your school about non-toxic cleaning products (of which there are many), including a customizable letter to start the conversation. I already sent the link to one teacher I know who is working to eco up our school. If you’re also concerned about hand sanitizers and liquid soaps in the classroom and bathrooms, be sure to check out the Skin Deep database to learn more about what’s in them, and consider donating a family-size jug (or 2) of safer alternatives, like Dr. Bronner’s, EO, Desert Essence, or Terressentials. We had a sub banned from our school a few weeks ago. She walked in and started spraying down the some disinfectant. She wanted to spray some more on one particular student’s desk, when she found out he had been sent home sick. The aide stopped her from making that poor child look like typhoid mary. Still she set off both my asthma and 2 students also became ill. I wipe down my desks using a vingar mixture 2 times a week or after messy projects. Every morning is a struggle for me. I (a teacher and working mom) send my children off to a school that holds a firm philosophy of using hand sanitizer (along with other horrible cleaning toxins), rewarding with candy, and serving horrible lunches to the students. I have been successful in changing my kid’s candy treats to stickers, requiring my children wash their hands, and packing homemade lunches…but I still struggle with the cleaning supplies the school uses and the fact that parents are not being educated by the system about what is best for their children. I struggle with the fact that my childrens’ mere presence in the school provides funding and encouragement for the many practices I don’t believe in and don’t wish to encourage. It is my dream to one day open a school that applies green practices in every way! The Healthy Schools Campaign publishes a free resource for schools – the Quick and Easy Guide to Green Cleaning in Schools. It’s a how to guide for a school to adopt a healthier cleaning program. Feel free to order it or access it online. All I can say is Norwex microfiber cloths! I discovered this complany about 6 months ago when we moved back to Canada after living in Germany for 13 years. Microfiber is very popular in Europe and with Norwex’s antibacterial cloths (they have a silver agent embedded in the microfiber) you can eliminate 99.9%of the bacteria on all surfaces using only water – no toxic chemicals to touch or ingest! This is how I clean my entire house and my next goal is my children’s school.